The transition from a growing to a nongrowing state is accompanied by a dramatic reprogramming of the protein synthesis profile. Vegetative proteins no longer required at high concentrations are no longer synthesized in nongrowing cells, and in some cases are even degraded in a specific manner [8, 9]. Other proteins with specific and nonspecific adaptive functions are strongly induced on a time-dependent scale. On the basis of proteomic studies, three main groups of stress/starvation proteins have been defined . The specific stress proteins induced by a single stress stimulus only protect the cell against this stress stimulus by neutralizing the stress factor, by adaptation to its presence, or by repair of damages caused by stress. Starvation-specific proteins, on the other hand, are produced to overcome the starvation by uptake of the limiting substrate with a very high affinity, by searching for alternate substrates not used in the presence of the preferred one (catabolite repression), or by chemotactic moving to new substrates. In addition to these stress- or starvation-specific proteins, general stress proteins are also induced, in this case not by a specific but by a wide range of unrelated stress or starvation stimuli. These general stress/starvation proteins may provide the nongrowing cell with a multiple stress resistance machine irrespective ofwhat kind of stress or starvation stimuli induced the nongrowing situation [4, 10]. The single stimulons can be visualized by the dual channel imaging technique , which is an excellent tool by which to identify all proteins induced or repressed by the growth-restricting stimuli. Two digitized images of 2-D gels have to be generated and combined in alternate additive dual-color channels. The first one (densogram), showing accumulated proteins visualized by various staining techniques, is false-colored green. The second image (autoradiograph), showing the proteins newly synthesized and thereby radioactively labeled during a 5-min pulse with 35S-L-methionine is false-colored red. When the two images are combined, proteins accumulated and synthesized in growing cells are colored yellow. After the imposition ofa stress or starvation stimulus, however, proteins not previously accumulated in the cell but newly synthesized are colored red, because these red proteins have already been radioactively labeled, but are not yet stain-able. Looking for the red-colored proteins is a simple approach to finding all those proteins induced by a single stimulus, thereby defining the entire set of proteins induced by one stimulus, called a stimulon . 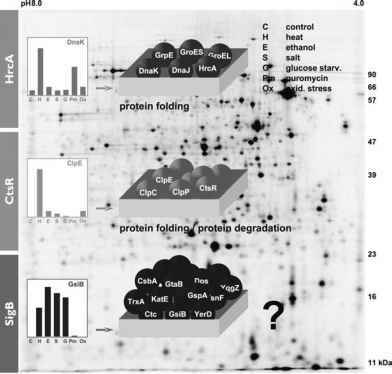 Heat stress, for instance, induces more than 100 red-labeled proteins (Fig. 3.2) . These proteins may be identified to gain an overview of how the cell is protected against heat stress. Proteins repressed by the stimulus can also be visualized by this powerful technique. Green-colored proteins no longer being synthesized (no longer red) but still present in the cell are the candidates repressed by the stimulus. scriptome profile of a mutant with the wild type under inducing conditions is the state of the art for defining the regulon structure (see Refs. [4, 12] for reviews). Furthermore, the allocation of as yet unknown proteins to stimulons or regulons that have an already known function is a simple, but convincing approach to a first prediction of their function . For instance, unknown proteins induced by oxidative stress and belonging to the PerR regulon will probably be involved in protection against oxidative stress. This dissection of stimulons into individual regulons characterized by a typical induction pattern of the members of the regulon is shown in Fig. 3.3 for the heat stress stimulon and in Fig. 3.4 for the phosphate starvation stimulon as examples (see Ref. for review). All proteomic and transcriptomic data can be assembled into an adaptational network consisting of a great number of stress/starvation stimulons and regulons. This network provides comprehensive information on the functional genomics and physiology of the stress/starvation response of bacteria. An essential feature of this network is the interplay between the individual regulation groups, because the individual stress/ starvation regulons do not exist independently of each other, but are tightly connected, forming the adaptational network. 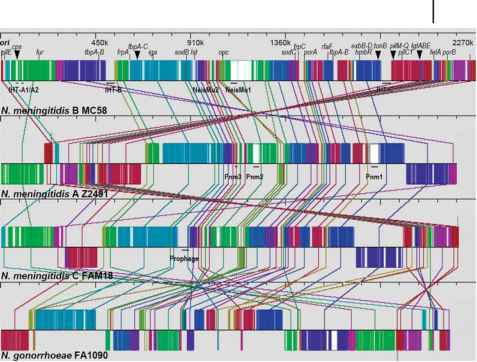 "Color coding" is a new software tool developed by Decodon GmbH that is highly convenient for visualizing complex protein expression patterns . Proteins induced by more than one stimulus can be visualized by a specific color code. The reason for the induction by various stimuli is in many cases that the corresponding gene is controlled by more than one regulator. For instance, the green-colored YvyD (Fig. 3.5) induced by heat, eth-anol, and oxidative stress is controlled both by rB and by rH . By applying this technique, already known and probably new overlapping regulons within the adaptational network can be visualized. Fig. 3.3 The heat stress stimulon of B. subtilis consists of proteins of the HrcA regulon, the CtsR regulon, and the rB regulon. 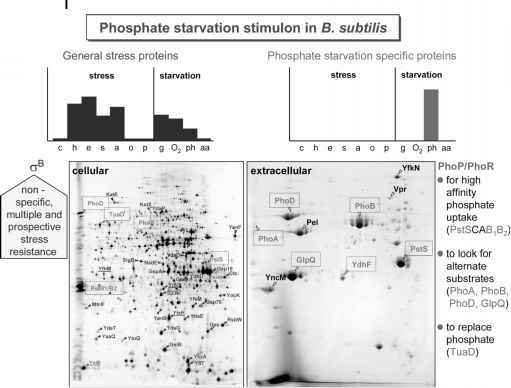 The induction profiles of representative proteins of the respective regulons under various stress conditions are shown: C, control; H, heat; E, ethanol; S, salt; G, glucose starvation; Pm, puromycin; Ox, oxidative stress (H2O2).